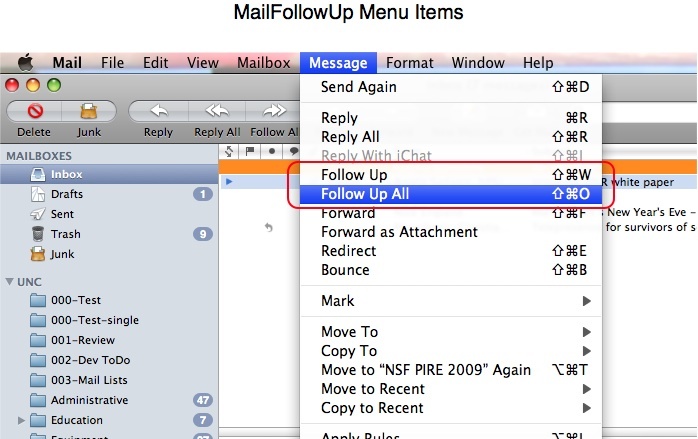 Adds "Follow Up" items to the Message and contextual menus (and optionally a toolbar button) of Apple's Mail application that allows you to compose (and then send) a quoted version of the original message to all of the original recipients, keeping the To, Cc and Bcc addresses as they appeared in the original message. In keeping with Mail's built-in Reply and Reply All functionality, the plugin adds "Follow Up" (original To: recipients only) and "Follow Up All" (all original recipients) functionality via both menus and toolbar items. A Little Press: Dan Frakes (MacWorld) wrote about my MailFollowUp and MailRecent plugins in his MacGems Weblog in January of 2007 and rated them in 2008. 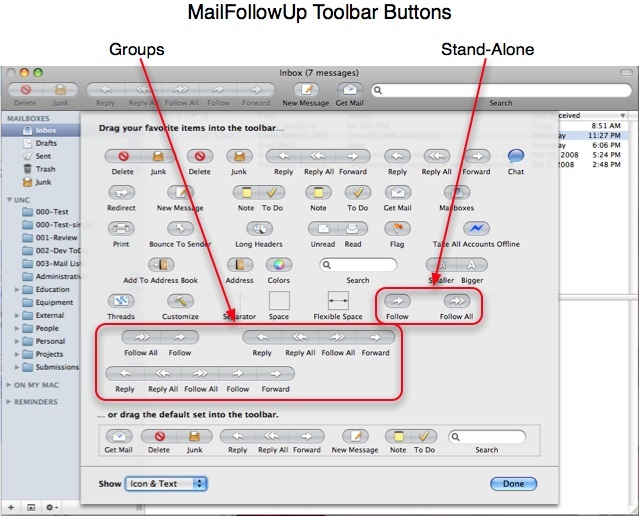 Joe Kisel listed MailFollowUp as one of his "nine must-have plug-ins for Apple Mail" in 2014. NOTE: As of 2.0, I am providing the plugin only. I cannot provide an installer, and you must perform a manual installation as described below. Cost: Free. If you like MailFollowUp please let me know. If you like, you can buy me a beer with the "Donate" button below and to the left. Similar to the "Reply" and "Reply All" funcionality built into Mail, once the plugin is installed (see instructions below) you should be able to select one or more messages and then choose either "Follow Up" or "Follow Up All," from either the Message or contextual menus. You can also use the keyboard shortcuts -Shift-W and -Shift-O respectively. If you initially select a portion of the text from the body of the original email, only that (quoted) text will appear in the followup. Follow Up toolbar buttons can be added via the toolbar customization panel, either as a stand-alone "Follow" or "Follow All" buttons, or in a various button groups. Instead what I wanted in this case was to send a quoted "follow up" message to the original recipients, as they appeared in the original To, Cc, and Bcc fields. To accomplish this I usually did a "Reply All" and then manually moved the original To recipients from the Cc field back to the To field. This got old, and so I set out to develop a Mail application plugin that did what I really wanted. With some help from Scott Morrison (see below) I was able to develop a MailFollowUp plugin. As with my MailRecent plugin, I wrote this MailFollowUp plugin for myself, but hope that others might find it useful too. You might need to provide Full Disk Access (link) for the Terminal application to successfully use the following commands. You should remove this elevated Terminal permission after you have issued the commands. Also, as of macOS 10.4.2/Mojave, Apple has incorporated a new Mail plugin management scheme. After you install any plugin (including mine) you must enable them from within Mail per steps 5–9 below. Download (see above), expand, and mount the MailFollowUp disk image. Drag MailFollowUp.mailbundle to ~/Library/Mail/Bundles/ ("~"means a user's home directory). You might need to create the Bundles folder if it does not already exist. If you have never used another Mail bundle, you will need to run two special commands in the Terminal application (omit the % prompt). Launch the Mail application again. Select “Preferences…” from the Mail menu. In the General tab click the "Manage Plug-Ins…” button near the bottom left. Select (check the box for) each plugin that you want to use. Click the "Apply and Restart Mail” button. After Mail relaunches the plugin(s) should be available, assuming all else is correct/well. Move ~/Library/Mail/Bundles/MailFollowUp.mailbundle to the trash. NOTE: As of macOS 10.4/Mojave this might or might not work for you. You might need to provide Full Disk Access (link) for the Terminal application to successfully use the following commands. You should remove this elevated Terminal permission after you have issued the commands. I want to thank Scott Morrison (developer of the wonderful Mail Act-On and MailTags) for help and code snippets that allowed me to develop both the MailFollowUp and MailRecent plugins. Thank you to Maurice Scharf for the French web page translation and localization help, Matthias Fichtner and Jan-Michael Frahm for the German localization help, and Paolo Boni for the Italian localization help. You are welcome to ask for support via email. I will respond if/as I can.